On the beach at Joggins Fossil Cliffs, Nova Scotia. This blog aims to help dog owners navigate the often uncertain world of taking trips with canine companions. Whether it’s a one day hike or a week-long journey across the country the idea is to share here what I have learned on the road with my dogs. The advice is related to domestic travel only. • Helpful reviews of dog-friendly places to visit and stay. • Tips for travelling with dogs in all seasons. • Information on tools and gear that can make life easier on the road when travelling with dogs. • Provide links to places where we have had success and to sources of information when planning longer trips. 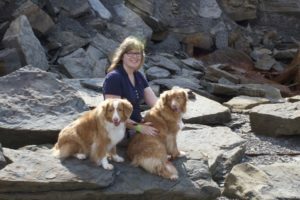 Jennifer Brown lives in the Greater Toronto Area with her husband and their Nova Scotia Duck Tolling Retrievers, Willow (Onepenny’s Bonnie Willow), Angel (Caliber’s Angioletto) and recently added Autumn, also a NSDTR who was introduced to us via Toller Rescue. Jennifer is an editor and writer who enjoys travelling with her dogs. It’s not always easy but it can be fun to explore all the places dogs are welcome. This is a personal blog. Any views or opinions expressed belong to the blog owner. All content is provided for informational purposes only. The owner of the blog makes no representations as to the accuracy or completeness of information found on the site or to information provided by external links provided. The owner is not liable for any errors or emissions in the information or availability of information provided. Unless otherwise stated, all photos and video are the property and work of the owner of Jennifer Brown. Comments are welcome but the blog owner reserves the right to edit or omit comments submitted if comments are considered spam, include profanity, language otherwise deemed offensive or containing hate speech, threats or attacks on individuals. The blog owner is not responsible for content in comments.